Papua New Guinea Prime Minister Peter O'Neill has welcomed the heightening of the status of bilateral engagement between PNG and China following talks over the past few days with China’s President and Premier. Meeting in Beijing on Friday, the Prime Minister further congratulated China’s President, Xi Jinping, on his recent re-election as President of China. “I hope President Xi continues the strong growth and development that we have seen in China, and around the region, during his first term in Government. “As developing countries we have many shared interests and challenges, and we need to work together. “Talks with President, Xi Jinping and Premier, Li Keqiang, were productive, and from this we have agreed on a number of issues that are very positive for Papua New Guinea. “Very importantly, Papua New Guinea and China will elevate our formal level of bilateral engagement. “Nearly four years ago we agreed to engage at the level of Strategic Partnership. “This is important from the perspective of enabling much higher level ongoing official engagements to negotiating trade and investment arrangements between our two countries. The Prime Minister said both Governments have now agreed to advance talks to establish a Free Trade Agreement. “A Papua New Guinea-China Free Trade Agreement has the potential to stimulate a significant increase in trade, business and employment if it is done right. 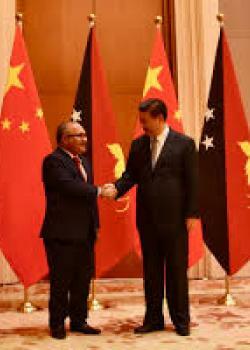 “The Prime Minister said Papua New Guinea has agreed to be a part of China’s One Belt and Road Initiative, and this will see immediate gains in the country. “Papua New Guinea welcomes the One Belt and Road Initiative that has been developed under President Xi’s leadership. “Papua New Guinea will support the initiative through a series of MOUs with the Chinese Government. The Prime Minister has further expressed his gratitude on behalf of the Nation for China’s support for Papua New Guinea’s hosting of APEC in 2018. “Papua New Guinea appreciates China’s support for hosting APEC in 2018. This includes the provision of a number of vehicles for use during the Leader’s week.“China is also providing a number of infrastructure projects including the refurbishmentof the International Convention Centre, the Poreporena Freeway rehabilitation and construction of the Independence Boulevard to Parliament. “At our meetings on Friday with President Xi and Premier Li, China has offered to provide supply of x-ray security items for APEC and technical support to manage the International Convention Centre. Finally, the Prime Minister said Papua New Guinea and China have agreed to continue to work together on a number of global issues where both countries have shared positions. “China and Papua New Guinea agree that reform is needed in the United Nations Security Council, to make it more relevant to modern global political requirements. “We will work together and with partner countries to advance the issue of reform at the UNSC. “Climate Change is a further issue where we share common interests and must coordinate our efforts. “Extreme weather and ecological change brought about by climate change is a threat that real, it is killing people and it is destroying property in both countries. “We have to synchronise our efforts in global forums, including co-ordination to pursue action on the deliverables identified in the Paris Agreement at COP-21,” he said.